Two mid-rise developments rising next to Wright’s Hollyhock House in L.A.
Los Angeles–based La Terra Development and Urban Architecture Lab are working to bring a combined 246 apartments and 23,300 square feet of retail to two sites adjacent to Barnsdall Art Park—home of the Frank Lloyd Wright–designed Hollyhock House—in L.A.’s Los Feliz neighborhood. Dubbed Los Feliz I and Los Feliz II and located at 4850 and 4900 Hollywood Boulevard, respectively, the two apartment complexes are designed to preserve views from the street toward the Hollyhock House, according to community preferences for neighborhood development. Renderings released by the developer show a pair of contemporary structures that feature a mix of vertically- and horizontally-oriented bands of projecting window assemblies, with the 4850 structure stepping back as it rises, creating rooftop terraces along lower sections. This structure contains a wide street frontage along Hollywood Boulevard that is occupied by storefronts and features a second-level courtyard, as well. The 4850 project aims to bring 96 apartments and 9,500 square feet of retail to the area, while the larger 4900 project will contain 150 units and 13,800 square feet of retail uses. The 4900 proposal, on the other hand, is articulated as a more conventional apartment block with a solid wall of repeating window bays and projecting balconies running the length of Hollywood Boulevard. Located just a few blocks from the Vermont-Sunset stop on the Red Line subway, the projects are also being marketed by the developers as having commanding views of the Hollyhock House, the Griffith Observatory, and the Hollywood Sign. The twin developments join a growing list of medium-density projects that are on the way to the transit-adjacent area, including a trio of similarly-massed apartments headed for Sunset Junction, a 202-unit complex from Killefer Flammang Architects, and a 96-unit project by architecture firm KTGY. 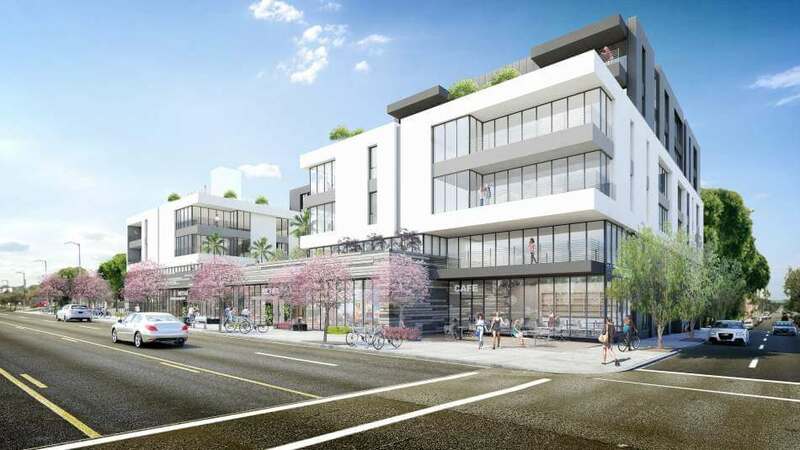 The La Terra projects are currently under development, but a timeline has not been released for either project, Urbanize.la reports. For more information, see the La Terra Development website. This week, the Los Angeles City Planning Commission voted to unanimously approve plans for the Killefer Flammang Architects (KFA) and Leong Leong—designed Los Angeles LGBT Center (LALGBTC), Anita May Rosenstein Campus in Hollywood. The new healthcare and housing campus will include 100 units of affordable housing for seniors, 100 beds for homeless youth, new senior and youth centers, and up to 35 units of permanent supportive housing for young people. The mixed-use complex will also contain ground floor retail spaces. The project aims to expand the footprint and offerings of an adjacent complex, The Village at Ed Gould Plaza, which contains movie theaters, art galleries, offices, and meeting spaces. 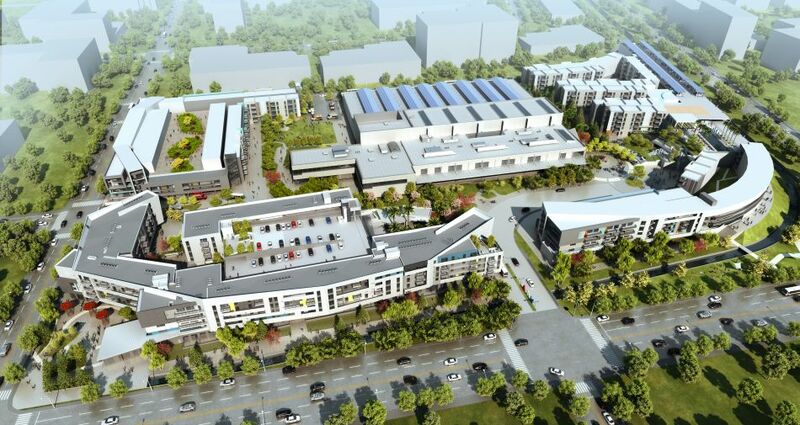 According to the only officially-released rendering for the project, the new and old facilities will be connected via interior and exterior courtyards and plazas, with the new building located at the corner of the block. The new three-story structure is composed as a series of stacked and curved curtain wall-clad volumes with the third floor extending beyond the perimeter of the lower levels along one side. The structure also features large, circular, and semi-transparent cut-outs that span multiple floors along these facades. In a press release for the project, KFA Principal and co-founder Barbara Flammang celebrated the commission’s unanimous approval, stating “We are delighted and excited that the Planning Commission recognizes the tremendous importance of the Center’s new campus,” she added, “KFA is proud to be helping increase the number of affordable housing units in a city that greatly needs them.” Because LGBT-identifying young adults make up a large portion of the overall homeless youth population, the project aims to fill a crucial void in services for members of that community in Los Angeles. LALGBTC CEO Lorri L. Jean told KPCC radio, “The new complex aims to help the two most vulnerable parts of our community, young people, and seniors who might face discrimination in other care facilities. Demand has skyrocketed in recent years and the need for affordable housing is particularly dire. The Center and our new campus are part of the solution to the growing problem of homelessness in our city.” For more information on LALGBTC’s services, see the center’s website.